Bahubali 2 Box Office Collection, Review Live Updates, Premiere Show: Baahubali: The Conclusion (review) is here and the wait ends. We brought to you the Bahubali 2 updates live from the first day first show. The Baahubali 2 benefit shows started at 8 pm on April 27, 2017, in selected theaters. It will be released on April 28 worldwide. Everyone will be able to watch then. Prior to its Baahubali sequel has created a lot of buzz and some records. It surpassed the opening weekend ticket booking figures of Dangal. The Bahubali 2 advance bookings started from Tuesday and sold over $1 million of tickets in advance. There is a lot of craze among the fans and movie watchers to watch the flick and know the answer ‘Why Katappa Killed Bahubali?’ Now, we are getting the chance to reveal it. According to current trend and latest report, it seems that Bahubali 2: The Conclusion will earn somewhere around Rs. 100 crores worldwide. In India, it is expected to mint around Rs. 100 cr (including collections of all languages – Hindi, Telugu, Tamil, and Malayalam). While overseas collection reports suggest collecting $5.5 million shouldn’t be difficult. It will be updated tomorrow morning. You can check detailed Bahubali 2 box office collections report here. Baahubali-2 lives up to the expectations will be much bigger hit. Compared to Baahubali-1 this part has a much better story and grand elements. Songs wise two songs are superior to the first part..However, if we account a total number of songs may be BB-1 slight better. The flip side, In second half through the middle story, felt bit heavy! VFX in pindari episode in the first half is not up to the mark. 11: 57 PM: Movie Completed with Balladeva killing. 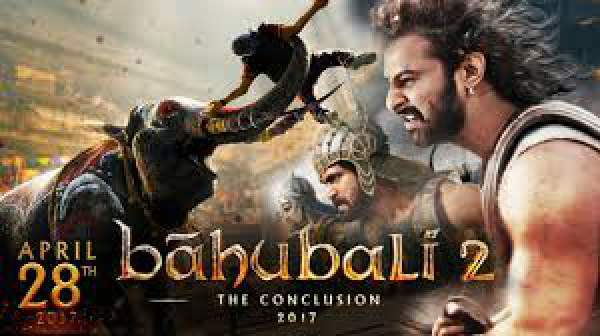 11:55 PM: With Mahendra Bahubali killing Bhallaladeva story of Baahubali Part 2 (The Conclusion) comes to an end. The second half is totally story based and a high octane climax! 11:51 PM: Now Shivudu (Baahubali) Takes with his soldiers and people went to Ballaladeva Empire and Big War Scenes Going on. 11: 45 PM:: A crucial conversation between Kattappa and Sivagami. Ramya Krishna’s performance is impeccable. Anushka raises the bar with her emotional performance. 11:39 PM: Its Time of War Sequence. i.e Katappa kills baahubali. Every Audience is in dead silent part. It’s very Heart touching and intensifies. 11:35 PM: The Suspense Twist Reveled and we are not revealing here. because of its toughest. Everyone should watch in the theater. 11:31 PM: Finally Revealed Interesting One, “Why Katappa Killed Baahubali?” . Secret Revealed. 11:24 PM: Heart Touching Scene with Dandalayya song Going on. The audience is Emotional. 11: 17 PM: The 2nd Half Begins with Family Drama between Anushka, Rana & Prabhas. 1st Half Report: The Mind Blowing Performance till Now and Rajamouli takes the film into a higher level than baahubali Part -1. Mind blowing Interval scenes. Prabhas, Rana, Ramya Krishna Are important assets in first half. Interval block is Epic (Superb). ‘Mahishmathi, oopiri peelchuko’ – the interval Title. 11:22 pm The ultimate face-off. All important characters are under one roof. Keeravani’s BGM spells varied emotions. 10: 55 PM: Interesting Scenes Going Between Rana and Ramya Krishna (Sivagami). The drama Intensifies. 10:52 PM: It’s Time for Kanna Nidurinchura Song. Anushka (Devasena) Sings for Lord Krishna. Beautiful graphics and Sets being showcased. 10:45 PM: Some Comedy Scenes going between katappa, Baahubali, Anusha & Subbaraju. Audience smiling with funny faces. 10:43 PM: Subba Raju Character as Kumara Varma made. 10:35 PM: The gorgeous Devasena, Anushka makes a grand entry. Huge cheer from the crowd. The Kuntala Kingdom is showcased beautifully in this sequence. Visuals Superb and Sets creation Marvellous. 10: 26 PM: Saahore Baahubali Song Going on. Visuals are stunning. 10:21 PM: Kattappa shows his intelligence and loyalty to Sivagami in a scene. Rana and Nasser enter the screen before Prabhas has a dialogue. 10: 19 PM: The film introduces Baahubali with Maha Ganapati chariot and elephant. Superb artwork is employed. 10:15 PM: OKa Pranam theme song starts. 10:12 PM: Sivagami introduces us to the film and she prays to God for the life of his son, Mahendra Baahubali. 10:07 PM: Baahubali 2 movie run time is 170 minutes, close to 3 hours, 2 hours and 50 minutes roughly. 10:05 PM: The world premiere of the movie started. Harsh Navlakha‏: #Baahubali2 #Baahubali2Review OMG! What an First Half.. Superb Visuals.. Sathyaraj Comic Timing.. fantastic.. Lots of Goosebumps Scenes. #Baahubali2 Review: 3.5/5 #Prabhas Delivers, @ssrajamouli Falters! #Baahubali2 has enough in it pull you inside that world, and shower you with a rewarding, glorious tale. In the prequel, Baahubali: The Beginning, we got to know how jealous BhallalaDeva (Rana Daggubati) was from his cousin Amarendra Baahubali (Prabhas). The power-hungry antagonist wanted to rule the Mahishmati kingdom. Mahendra Bahubali, the son of Amarendra, learns his true self and escapes his mother Maharani Devasena from the captivity of his uncle. However, it ended with Kattappa (Sathyaraj) backstabbing a sword into the prince Amarendra. It made the audience to guess ‘why the hell Kattappa even killed Baahubali’ when he used to love him the most. Every character has its own qualities and significance in the big budget film. Actor Prabhas dedicated 5 years to his life just to this franchise. Hence, the costume designer Rama Rajamouli made him look special and above all other star casts. Rana Daggubati should be appreciated too. He has maintained himself for an iconic antagonist. Stay tuned to TheReporterTimes for Baahubali 2 collection and Bahubali review by us, audience, and the critics.